Lately when I’ve hung out with mom friends, we end up swapping school stress stories. We commiserate over homework battles. And how to manage all the different kids’ needs with crammed afternoon & evening schedules. We share how we want to instill responsibility, but struggle watching our kids get in trouble over forgetfulness. Only a month into school, many of us have already received the negative behavior reports. And we wonder how to manage the issue from our end. 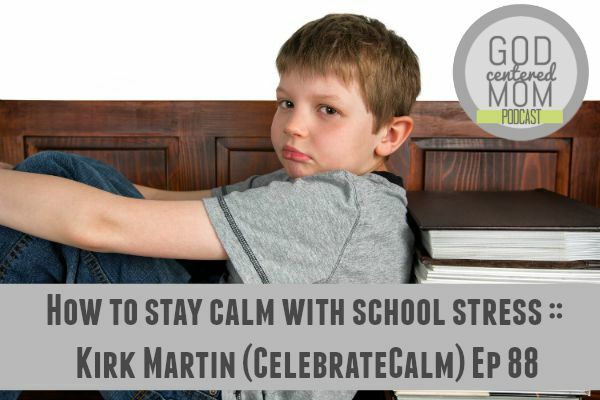 It seems to me we all need a little calming pep talk from our friend, Kirk Martin (CelebrateCalm.com). Before interviewing Kirk, I asked y’all on Instagram & Facebook to share some of your school stress questions. And we got so many great ones! Thank you!! So in this episode, we chat about creative ways to motivate our kids while keeping the long term goals in mind. We hit on the topic of perfectionism, children with special needs, competition among siblings, and loads more. Most of all, I loved Kirk’s example of the prodigal son’s father (Luke 15) in fostering an inviting, grace-filled environment. What should my long term goals be when helping with their homework? Should kids do homework right when they get home from school? How do you manage 3 kids’ homework, especially if one has special learning needs? If my son gets in trouble at school, should he also have consequences at home? How do we handle competition, vying for position between sibling? What do we do with our perfectionist children? How do we help them not give up? How do you help a child with ASD persist when school is hard for him? What if my Kindergartener doesn’t want to go to school? Could you post the link to your schools top 35 great books by grade that you mentioned? Love listening to your podcasts! Thanks for all the work you do to prepare and post them. Such a great, uplifting messages! oh yes! thank you jenny for pointing that out!! just added it to the “links” section of this post. Thanks for listening!! !